1. 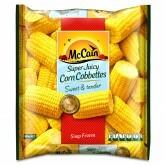 Place McCain Corn Cobbettes in a large pan of salted water and bring to the boil. Simmer gently for 8 minutes, or until the corn is tender. Drain in a colander and allow to steam dry. 2. Meanwhile, for spicy mayo, combine mayonnaise and cayenne pepper in a small bowl. For spice mix, combine cayenne pepper and sweet smoked paprika. 3. Place melted butter with honey into a small bowl and stir well to combine. Once the Corn Cobbettes are dry, brush with a little of the butter and honey mixture. Place on a barbeque or in a preheated grill pan and cook, turning the Corn Cobbettes, until lightly toasted. 4. Pour the remaining melted butter and honey mixture into a shallow tray. Remove the Corn Cobbettes from the grill and roll in the butter and honey mixture, sprinkle with spice rub and serve with spicy mayo, wedges of lime and topped with finely grated parmesan cheese. 1 Place McCain Corn Cobbettes in a large pan of salted water and bring to the boil. Simmer gently for 8 minutes, or until the corn is tender. Drain in a colander and allow to steam dry. 2 Meanwhile, for spicy mayo, combine mayonnaise and cayenne pepper in a small bowl. For spice mix, combine cayenne pepper and sweet smoked paprika. 3 Place melted butter with honey into a small bowl and stir well to combine. Once the Corn Cobbettes are dry, brush with a little of the butter and honey mixture. Place on a barbeque or in a preheated grill pan and cook, turning the Corn Cobbettes, until lightly toasted. 4 Pour the remaining melted butter and honey mixture into a shallow tray. 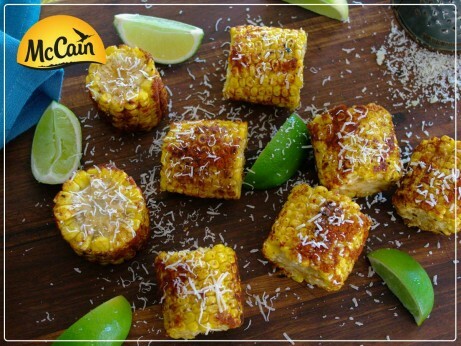 Remove the Corn Cobbettes from the grill and roll in the butter and honey mixture, sprinkle with spice rub and serve with spicy mayo, wedges of lime and topped with finely grated parmesan cheese.